5 Comments on #EyeSpyLondon: The First of Many… Firsts! Hello all! Yes, we finally had a good whiff of the English air, and are back. It was a much-awaited trip and we were soooo looking forward to visit baby V’s Godma! Unlike our previous holidays, this trip was an eye-opener and a challenging one to boot as it was just the 3 of us. As a person or a mother, it was a learning opportunity of sorts which widened our horizons to take in new inspirations. Too many things happened – both good and bad – and here’s a sum-up of our take-aways. 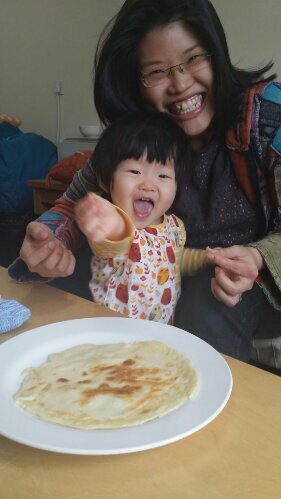 We have flown to Taiwan (here and here) and Penang (Day 1, Day 2, Day 3 and Day 4) with her at 8mo and 11mo respectively, and did a roadtrip to Malacca (Day 1, Day 2 and Day 3) when she was 14mo. Truth be told, she was unexpectedly good during the rides. One thing for sure, nursing does help provide comfort but honestly, it was tiring. Thankfully, she falls asleep during the plane rides but it ain’t a breeze for my arms at all since they had to be pivoted in a “try very hard to be comfortable” awkward position lasting from 30minutes to hours. But hey, anything to prevent other passengers from throwing dagger stares, really. Add to that, her little body DISLIKES bassinets. So no bassinets for sleeping, only to hold stuff. 17hours, to and fro. Thank goodness for a stopover at Doha to wriggle numbs muscles! 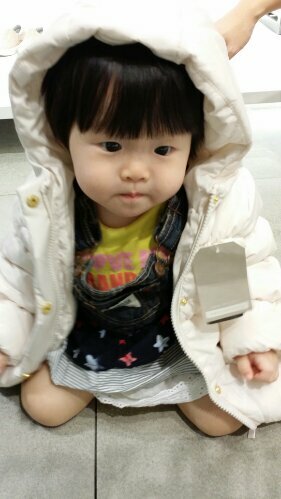 The cool climate was perfect for the little one, and she loved it! Hardly perspired though her Godma did highlight we might have gotten her overheated at times. Winter meant layering, and my lovely friend, J, kindly lent us toddler clothes that her stylo kid decked out in. But that did not stop us from picking out a Zara down jacket at a steal because we knew the temperatures fluctuate quite abit – 4 seasons in a day, no less! Hubs and I have stayed at min su (homestays) during our pre-honeymoon trip to Hualien, but staying with my bestest buddy is a different experience altogether. We see each other’s morning faces and unruly hair every day, pick out clothings to put on, discuss and decide what to cook (yes, we cooked quite a bit during this trip when daddy was not around! Nothing beats hot homecooked meals!) and share girlie secrets and updates in our lives. It’s like we were never apart during the time she relocated. But not all things were rosy, we got meltdowns so often, I think we might have scared her (and her impending baby!) and hubs with parenthood. Let’s just say, it was probably a cannot-be-true-er first dips into a family with a bub, eh? Sharing Polish pancakes for breakfast! 6 years ago, my then-bf, now husband and I backpacked Europe over three weeks, visited gorgeous places in Paris, London, Prague and Venice. With a tight budget, we scoured B&Bs for the nights and these hotels were centrally/conveniently located. Fast forward to present day, we are still adamant about not spending lavishly (and easily) by putting up at fancy hotels in Central London, but made ourselves extras by invading the privacies of familiar faces (HEH!) where home is in Weybridge, Surrey, which takes 2hours of public commuting to get to from Central London. 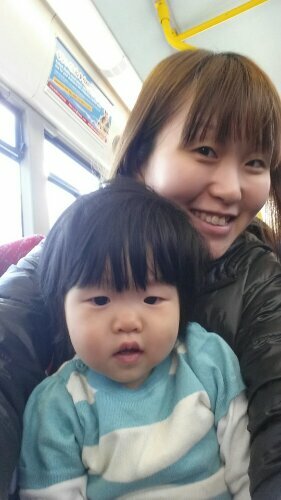 We could have gone the easier way, especially with a baby, but the lure of spending MORE time with an old friend was much too strong and I secretly wanted a slice of her life we took up the challenge to be prudent. Material needs are well, material needs. As long as we had a proper roof and sleep environment, I think we were belly happy there without needing to shell out extravagant pounds. Hello to a no fancy pants holiday and YAY to a challenging family adventure! Two weeks at cosy Pear’s, I have learned that it IS possible to have a decent comfortable life in the world’s most expensive city (oh wait, did Singapore kick London off the top spot?? ), without splurging excessively and mindlessly. Sure, it’s easy to call for a cab (£5 for a 6min drive, £27 – £36 for Heathrow Airport to Home in Weybridge and vice versa) or get on the bus (£7/pax for return within Surrey) but the prices might make you think twice. In Singapore, we complain about transport prices and walking leaves us pale in the face. During our trip, we walked 20-30 minutes from home to get to the nearest train station – while catching up with stories, enjoying the breeze and beautiful English homes and landscape along the way. It was a stark contrast from the usual convenience back home and while it was different, it didn’t take long to adjust too :) Despite the tight space after our invasion plus our barang barangs (you bring half a home when travelling with a baby! ), and the need to wait for the boiler for hot water baths, we enjoyed the crisp cold air and squirrel and parrot sightings in the mornings nonetheless! P/S: We did an exclusive interview with Andrea, who will be contributing articles on The Hooting Post, sharing tips and tricks on surviving on a budget in London – keep your eyes peeled! If you’ve read the previous point, you’d know that knocks and bumps are inevitable. Well, yes, she had a few battle bruises here and there, thankfully nothing too serious, but each one gave mama a heart attack, no less! 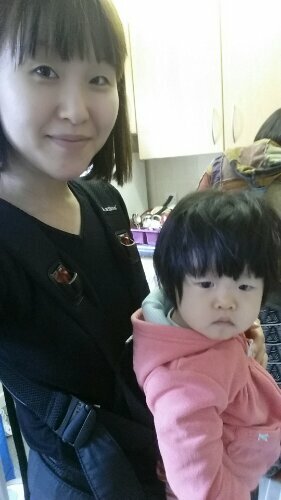 Grouchy little one.. mummy had to babywear while helping out with cooking. Flying long haul was never on the cards. Only because the hubs had to travel for work, and we deliberated on the options. The main case in point was my first week alone while he travelled to Germany. I didn’t give it much thought initially, until IT happened. Unfamiliar place + new faces + only mummy = super sticky koala. Let’s just say, I couldn’t stay out of sight for more than 10mins. Going to the toilet, taking a shower or moving away meant wails, really big ones. Plus she was teething, and diaper changes were nightmarish. 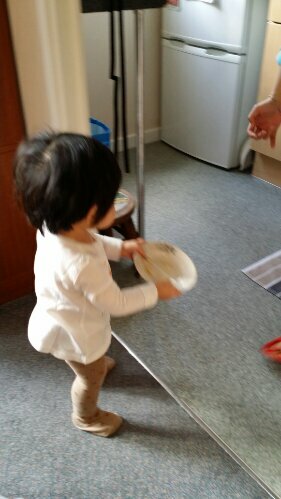 Eating took a much longer time – she started to choose food by pointing or shaking her head, not wanting to allow the spoon to touch her. Oh well… Just hope the neighbours didn’t think we were child abusers or something. And the man is happy! 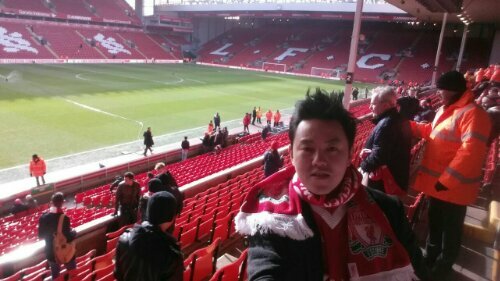 Finally caught a Liverpool match after an unsuccessful attempt 6 years ago. And i’m the happy wife who made sure he got this checked, pronto. *beams* Well, a happy husband makes a happy wife! Let’s just say, being all wrapped up under layers makes things harder. 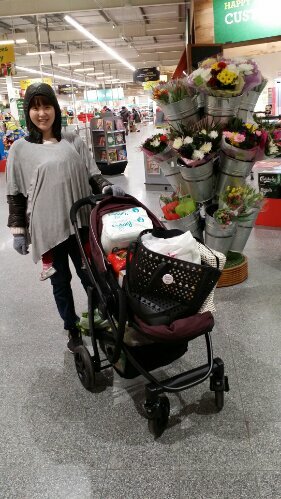 Couple that with solo parenting (read: babywearing allowed by mummy only!) meant aching shoulders, breaking backs and tired legs. Add a fussing tot who can now communicate her desire to be nursed – it can be quite a scene to reject her in public. While it was challenging, it also added to my “achievements”, and made me realized that it was actually possible! I guess that’s what motherhood is about. Note to self: Bring more button-front tops! This must have been the worst bit – towards the end of our holiday, baby V had a fever, which brought on a runny nose. That gave us a cranky, sticky kid who (still) only wanted mummy. That was the first time she was ill, per se, with meds dispensed. A trip to the GP (free consultation and we’re only tourists!! We definitely don’t get this in SG!) deemed a viral infection, which erupted into coughing spells on the last 2 days. Not the best thing to happen or bring back, but my unwell bubba broke my parents’ hearts, and the guilt in me rages. #parentingguilt Getting a winter jab might have been the wiser option prior to flying. So folks, if you’re planning a trip to cold temperates, check with your child’s PD or GP on that, okay? So our trip was full of ups and downs, but we hated enjoyed and appreciated the curve balls and challenges (comes with parenthood, eh? If you can’t beat them, join them!) along the way. Are we still up for travelling with just daddy, mummy and Vera? Uh-huh. All in good faith – “this too shall pass”. Now, allow me to stone from the jetlag and lack of sleep from #soloparenting nights whilst the man is paying his dues for our country’s safety………. Previous Entry Expectant Mamas (and Papas! ), Come Strut Your Bump!